You must be a member of the Munich Badminton Group to attend this activity. Would you like to join this group? This is the doubles activity (you play with a partner) ! 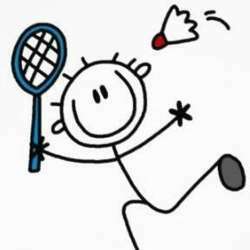 Let's go and have fun playing some badminton. Please come early enough to change and be on the courts on time to start at 2pm. BE SURE BEFORE SIGNING UP FOR THE EVENT! Latest cancellation time is Friday at 2pm (14:00), if you do not cancel and do not come YOU WILL HAVE TO KINDLY PAY YOUR SHARE! Since we handle a waiting list, guest list will be closed once full, Cancellation requests should be posted on the activity wall. Despite the usual waiting list, avoid cancelling at the last minute if possible. Do not hesitate to call me if needed. If the list is full just ask to be put on the waiting list by posting your request on the activity wall. This week we have extra courts available so more could join if necessary (ask to be put the waiting list, on the wall of this activity), to avoid court not being filled we are posting only 3 to start with, more will be assigned if enough players are on the waiting list. Confirmation for those on the waitlist will be sent on Friday after 2pm, the cancellation deadline . !!! PLEASE READ THE FOLLOWING !!! Once the event registration is full, you can ask on the wall of the event to be put on the waiting list as we usually have more courts available than those offered at the start, you have good chances to get to play. However, once you join the waiting list, it is the same commitment as if you are registered for the event which means that after the cancellation deadline - which is 48 hours before the event starts - you will have to pay the 10 Euros fee if you are not available when a place is free for you, no matter what and no matter whether your place can be filled or not. Such fee collected will then be used for and within the group events. Will not be handled. In order not to pay the 10 Euros fee for late cancellation you will have to find a replacement yourself and get him or her to contact me, confirming they are taking you place (per SMS, call, whatsapp, of Internations message), this will have to happen at the latest the day before the event (for Sunday games until Saturday evening 22:00). See you all for some fun badminton!